A vertebral compression fracture (VCF) occurs when the vertebral body fractures and collapses. Most VCFs are caused by osteoporosis, a disease that causes bones to become brittle and break easily. Compression fractures can also occur as a result of certain types of cancer or tumors. Balloon Kyphoplasty is a minimally invasive treatment in which special balloons are used to gently elevate the bone fragments in an attempt to return them to the correct position. X-rays and magnetic resonance imaging (MRI)are used to determine the exact location of the fracture before the procedure is performed. 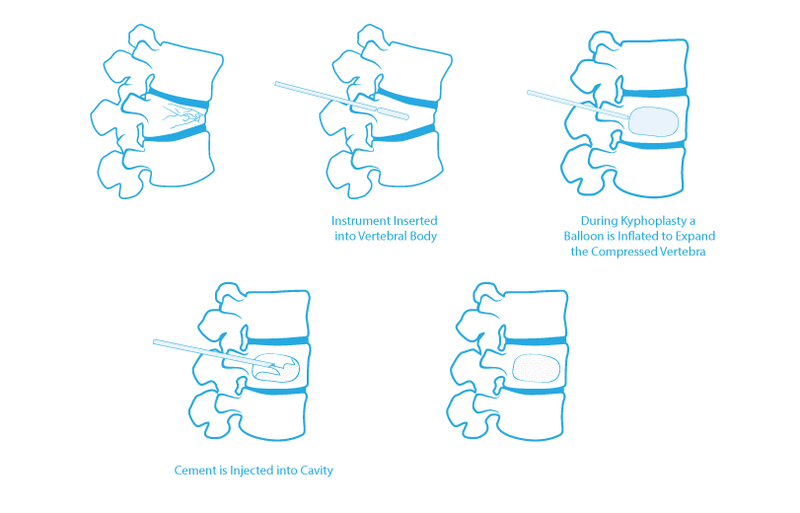 Compared to the standard Vertebroplasty procedure, Kyphoplasty adds the introduction and inflation of the balloon. This provides the advantage of allowing the cement to be injected into the space created by the balloon under a lower pressure than would otherwise be required. Kyphoplasty also provides, in some cases, the ability to raise the collapsed vertebra and return it to its normal position.